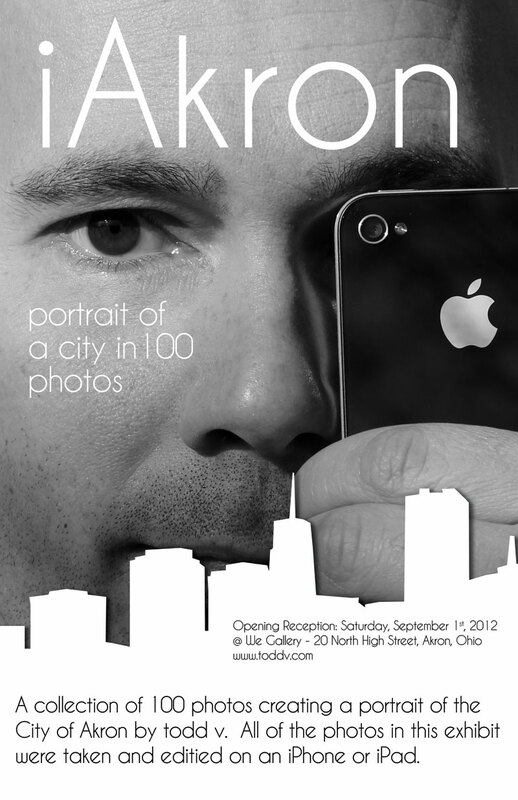 This exhibit will be a collection of carefully selected iPhone photos from his daily life in the city. Using the iPhone as if it is an older ‘holga’ style camera, these photos will be shown in a series of 6 x 6 inch black and whites, and projected on the gallery walls digitally during the opening reception. Additionally, the entire collection will be available as a small coffee table book. Signed copies will be available at the We Gallery during the exhibition. This entry was posted in akron, Art News, arts, exhibits, galleries, ohio, photography and tagged akron, art, art news, arts quest, black and white, black and whites, city of akron, coffee table book, exhibit, exhibition, gallery, gallery walls, iphone, live, ohio, photo, photography, show, todd v, we. Bookmark the permalink.